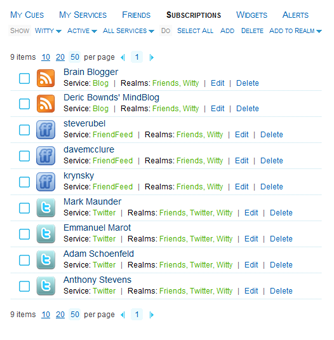 Cuesense gets more interesting when you add your Twitter following and favorite blogs to your subscriptions. You can tell Cuesense which services you are already using on the Account>My Services page and we will import your favorite feeds and start crunching them for gold nuggets of knowledge. You can also add individual feeds on the Account>Subscriptions page. Click on the Add link and enter the service type and publisher (a nickname, a URL or an email, depending on the service).